Like some of the others, this is pack has a few of those little extras that can make an out-sized difference. This one is really the more sophisticated sibling of the Acme Magic Tape. It fills much the same role, albeit in a fresher, newer, non-linear way. What’s it do? Well, like the original Magic Tape, this one shows the proverbial “tape” (see below). Though instead of just showing each transaction as a buy or sell in a vertical sequence of times and numbers, this MagicTape2 splits each transaction into buys and sells, then sends the buys skyward and the sells Earthward. In addition to this, it calculates and displays an instant, rolling volume delta, as an easy-to-understand percentage, based on a configurable number of previous transactions. This may be a very interesting alternative to reading the DOM for many folks who can’t or choose not to. Available in the Deluxe and Pro Editions only. The ability to mark block trade sizes. There are regular block sizes and mega block sizes. You can set a special color for mega block sizes so that they catch your eye. Provides multiple levels of optional tick aggregation, allowing you to effectively slow down the tape. Level 10 is the most aggregation, 1 is the least. Aggregation can be an enormously useful feature for internalizing pulses of volume which would simply race out of view on a normal time and sales display and is especially useful in the CME, NYMEX and other futures contracts. Please see just below the screenshots for more information and watch it in action here. Pro Edition only. 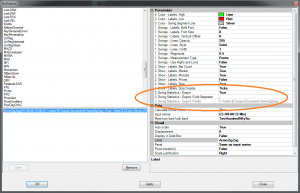 Block trades have optional and configurable audio alerts. Sound files are provided in the audio alerts pack, but virtually any sound can be used. 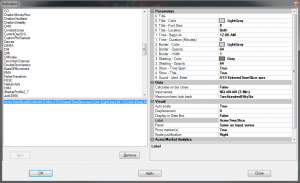 See the FAQs for audio alert configuration information. The ability to filter out transactions below a minimum size of your choosing. Note: this parameters affects the display only – the volume delta/imbalance calculation uses all volume. 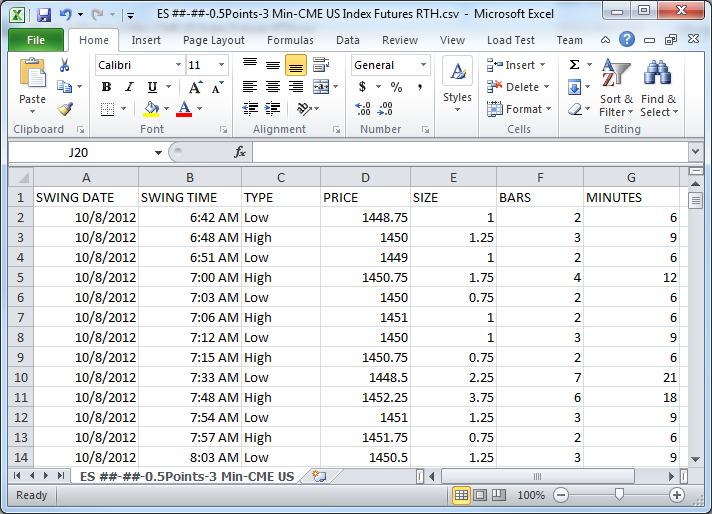 Set the real-time volume delta/imbalance to evaluate a configurable number of trades. The ability to update itself in near real-time. Careful, though. Setting to true will cause all indicators on your chart to update too, so make sure your machine can handle the increased load. 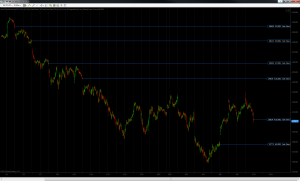 Can be attached to the left or right side of a chart. All colors and the font sizes can be customized. You have 2 choices for determining whether a transaction is a “buy” or a “sell” – either by using upticks and downticks or the bid and ask prices. The choice is yours. We think it’s important to to help you understand what the aggregation feature can and can’t do for you. Since October 2009 the CME (and other CME-managed exchanges) began reporting actual fills as opposed to actual orders for many instruments. Prior to this date, for example, when a 400-lot buy order was placed and filled it came across the tape as one 400-lot tick regardless of how many smaller sell orders were taken from the sell queue to fill it. Today, that same 400-lot buy order will be reported to you as all the (usually) smaller sell orders it took to actually fill that order. Thus, you never know how big or small the originating order really was. This was an important change because it made it harder to divine participants’ intent and also because now there is much more apparent volume for many instruments. Though in reality there are just more ticks for the same total volume than before. Well, this 2009 reporting change wreaked havoc with the perceptions of many a talented tape reader, especially those trading high-volume instruments like the ES. Still with us? Ok. Here’s where the aggregation feature comes in. The multi-adjustable aggregation algorithm in the Magic Tape 2 can help group these smaller orders together to make them easier to see, understand and incorporate into your trading. It does 3 essential things: 1) it effectively slows down the tape to allow you to better process the buying and selling you’re seeing; 2) it can make it even more obvious when bursts of buy or sell volume step into the market; and 3) it can approximate larger orders which may have been placed by the initiating (buy or sell) side. That leads us to a critical point. 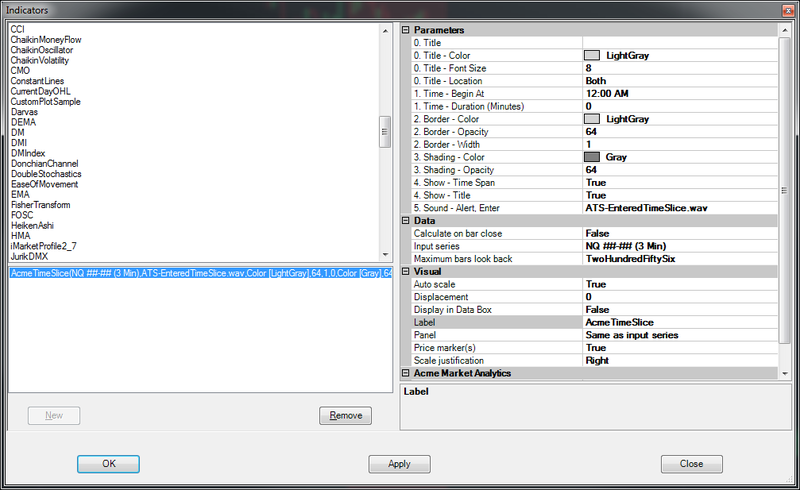 Despite what you might have read or heard, due to the nature of the market data itself, the actual fill reporting method and the technical details of how market data feeds deliver information from the exchange to your trading machine, precisely reconstructing the example large buy order above from the resulting/reported fills is a technical impossibility. We can make a pretty good guess at it, though, because of the way the CME reports these fills in the market data stream. So with the Magic Tape 2 aggregation turned on, you’re seeing the same total volume as you would when it’s turned off, but the ticks on the display are aggregated based on some characteristics we’ve identified in instruments traded via the CME’s FIFO order matching algorithm. Oh, one last thing – this indicator does not work at all with historical data. It’s for visualizing real-time transactions only and is great for placing in your peripheral vision. Watch it in action. If you know your instrument tends to swing 10 ticks on average and 20 ticks at the 2nd standard deviation extreme, and you’ve already seen a 20 tick move, what’s the probability of further move in the same direction? Ding ding! That’s right, about 5% or less. 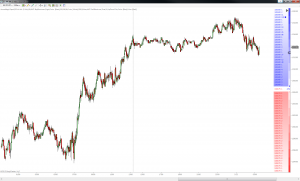 Our Zig Zag study not only helps you visualize the swings on the chart but, as seen in the example above, can export them for deeper study as well. Available in the Deluxe and Pro Editions only. 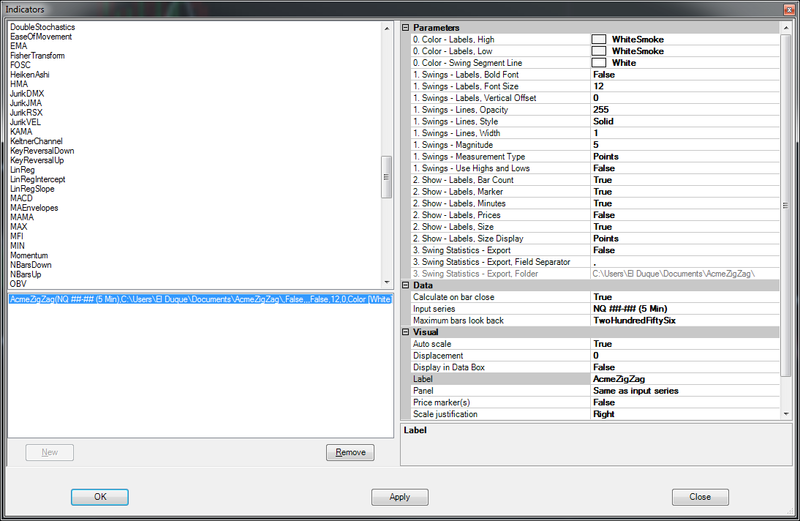 Can display prices, minutes, bar count, swing magnitude, and an optional character marker for each swing. 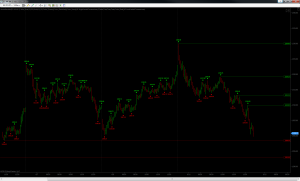 Uses any of the standard NinjaTrader “input” types such as Close, Median, Typical, etc, or the bar High and Low. New swings can be determined by either point or percentage movement. Displays swing magnitudes in either ticks or points, which is helpful for a cleaner chart on instruments with very small tick sizes such as currencies and bonds. 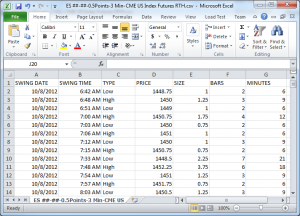 Swing/rotation data can be exported for deeper study in the data analysis tool of your choice such as Microsoft Excel® or Google Spreadsheets (Pro Edition only). As is the Acme way, all colors and lines are completely configurable. When someone comments that you’re a ‘minimalist’ how do you react? Well, no one likes to be labelled, but if somewhere deep down in your gut you know it’s at least partially true then this one should appeal to you. Really, its beauty and usefulness are in its simplicity. It has blissfully few parameters – its one and only function is to track the session range midpoint. Perhaps best of all it supports split sessions ala most of the other Acme session-focused studies. Available in the Deluxe & Pro Editions only. 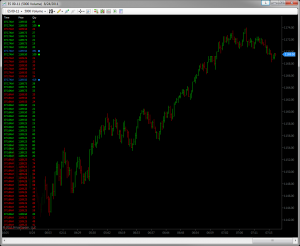 Are you an index futures trader? 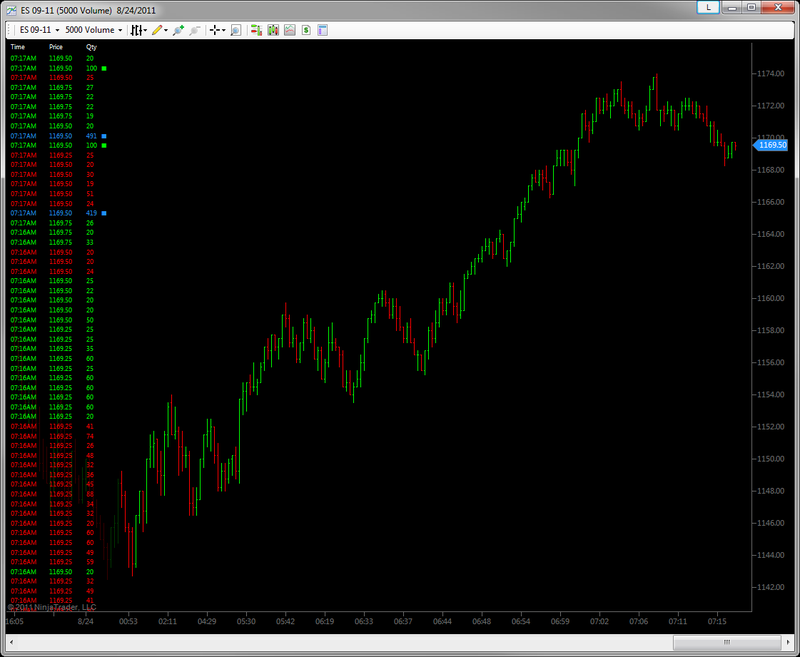 Do you wish there was a simple way to track the equities cash close versus the instrument close? Trade currencies or precious metals and want to track prices at the times then other markets close? And do you wish that there was a way to have the price appear on the chart as a “naked” line that would disappear when it was tagged again at a later date? Well, wish no more. It’s here and it’s got some very interesting features too. Available in the Deluxe Edition only. 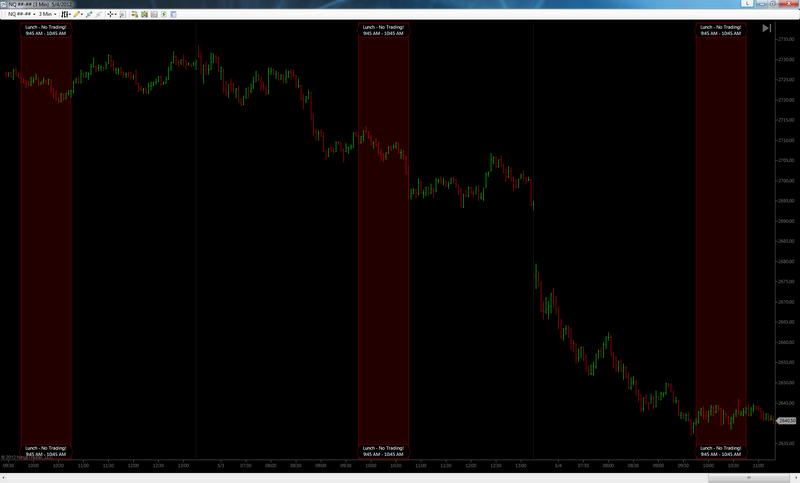 Creates one time/price line per day at the specified time, extends the line forward in time. The line can be created at the open, high, low or close price of the specified time. Multiple instances of the indicator can be used to create custom ranges or track the open and closing prices at key sessions (i.e. Chicago, New York or London). 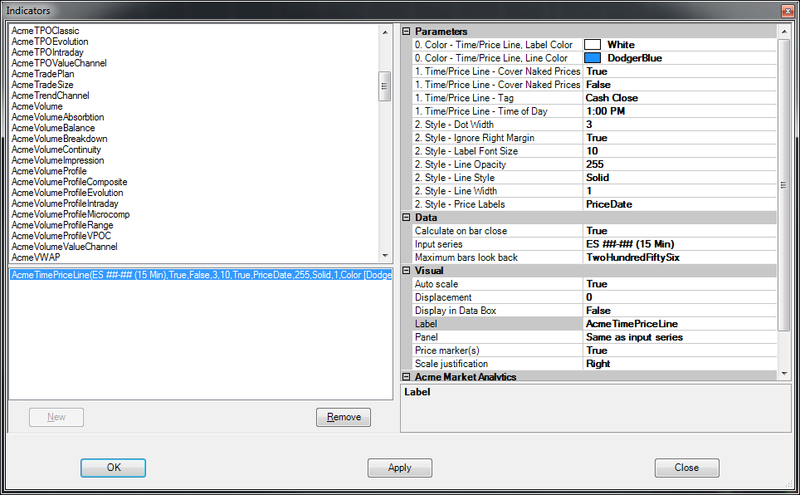 Optionally labels the time/price line with a trader-specified tag (i.e. a name), the price, the date, the time or several combinations of all the above. Price/Time lines can be removed from the chart once touched in a subsequent day, or can remain on the chart indefinitely and be observed on a long-term chart as a cluster. Multiple instances of the study can be placed on the chart, each creating and tracking a separate set of time/price lines. 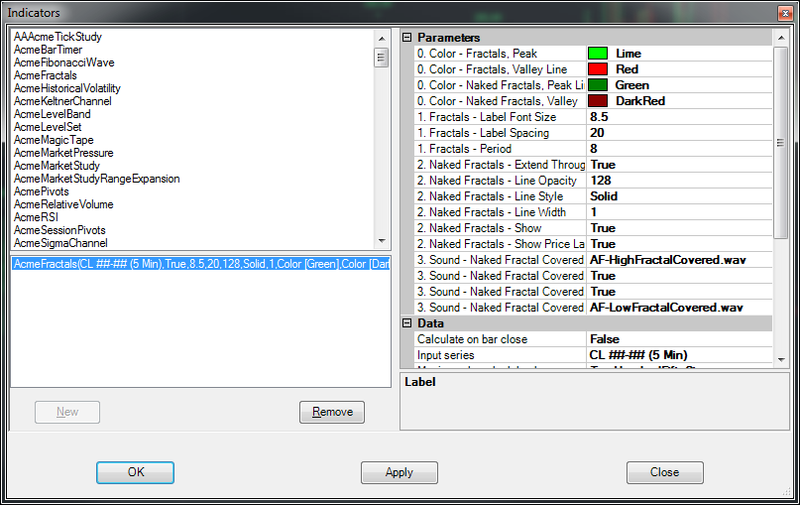 Naked price/time lines can be configured to only be covered during the instrument’s default session only (usually RTH), or at any time on a subsequent day. 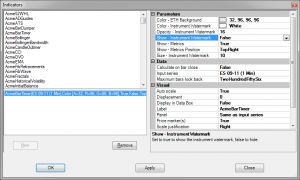 Line colors, widths and styles can all be configured for use on any chart scheme, and can be used on any bar type. Minimalists unite! 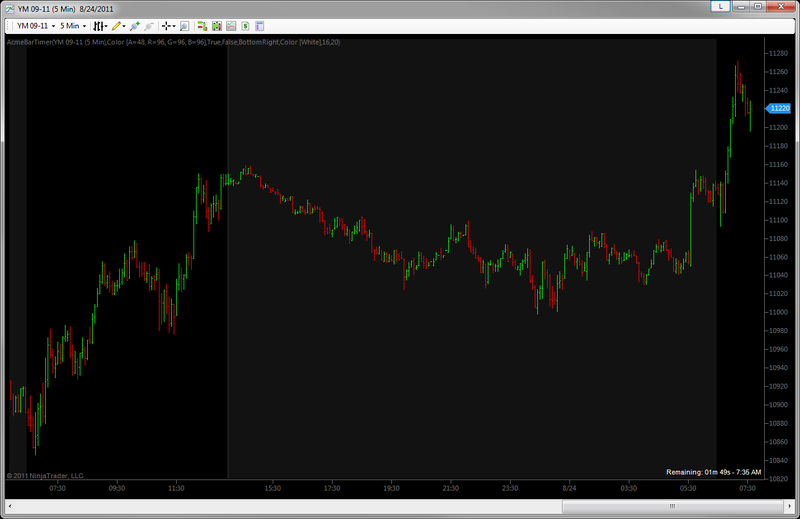 The Acme Initial Balance (IB) shows displays the initial balance range and nothing but. Except, of course, up to 4x upper and lower 50% IB extensions, which covers more than 99% of trading days in all futures instruments. To minimize clutter on the chart, each extension automatically appears after the IB range is known and as price tags each successive level on either the high or low side. Available in the Deluxe Edition only. 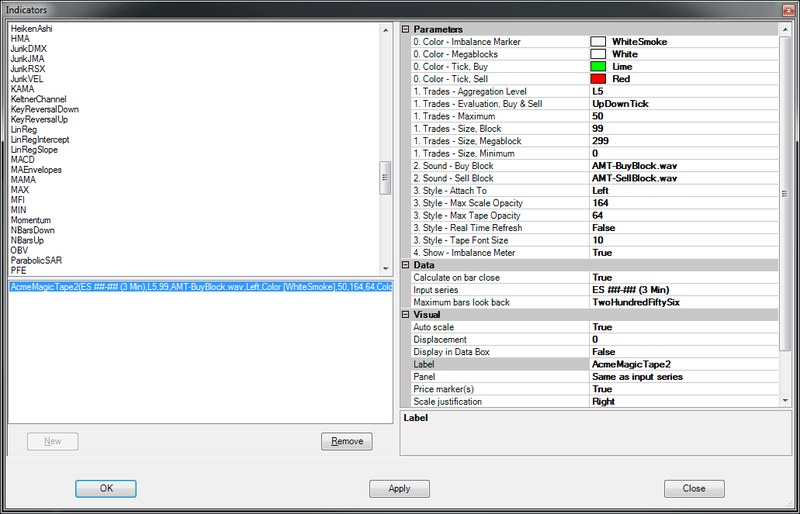 Displays the initial balance range generated in a configurable number of minutes, with 60 being the traditional default. 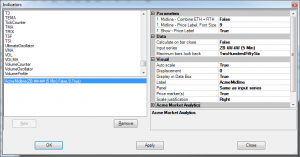 High and low prices of the range can be custom-labelled, such as PAH/PAL or IB30H/IB30L, allowing additional options for distinguishing one range from another when using multiple instances on a single chart. Optionally displays up to 4 fully configurable IB extensions during both the ETH and RTH session (if configured for split sessions). 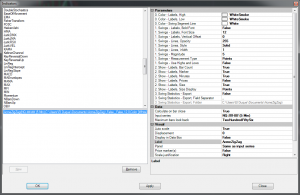 Extensions use a compounded 50% step-up by default and can be turned off for either session, or both. Individual extensions can be turned off by setting the color for that extension to Transparent. Labels can be attached to the left or right of the session. All line colors, widths, styles and font sizes can be customized. Even wanted to highlight a time in the trading day when you should pay attention? Know of some special times of day where volatility is statistically high? Well want no more. The Time Slice allows you to define, highlight and label a regularly occurring span of time each day. For example, you can use it to highlight the Globex session, the lunch hour, the London or Asian sessions or just about anything of that ilk. You can have as many slices on a chart as you like, they can be in sequence and they can even overlap. It also has a configurable audio alert that can be triggered when a bar enters the slice or zone. 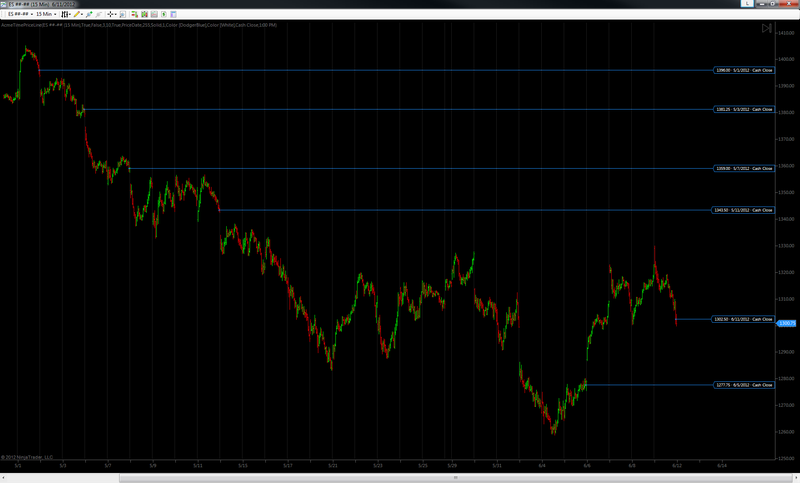 In some ways, you can think of it like the Acme Trade Plan, only with vertical bands instead of horizontal ones. 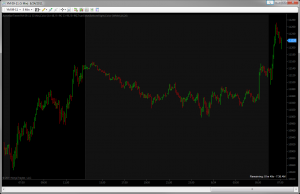 A simple thing really, but it can really help visually organize your chart and help you pay attention to the price action instead of the clock. Available in the Deluxe Edition only. Many traders have seen pictures of dots and prices at the peaks and valleys of the price action. You may have wondered what they are called. They are (somewhat cryptically) called fractals. And in some systems of technical analysis they are important in predicting reversals or continuations of the prevailing trend or swing. For others, they are a great way to keep track of which recent swing high and swing low prices have yet to be touched again, making it easy to visualize and quantify range narrowing/widening see breakouts/extensions well before they happen. For somewhat more detail, read what Investopedia says about them here. Here is Acme’s take on the concept and as per usual, it has a couple of fresh twists. Available in the Deluxe Edition only. 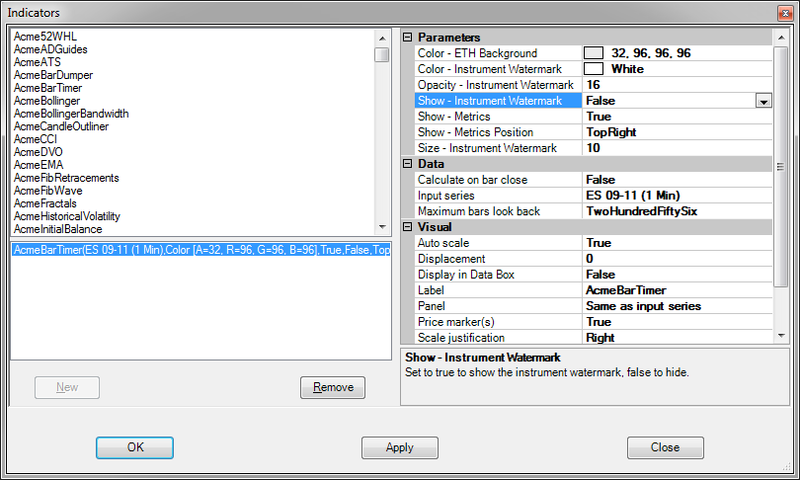 Fractal periods are configurable for tuning to your instrument’s natural swings as well as your time frame. Fractal price levels can be extended forward in time until price touches that level. In volume profiling terminology, this is known as being naked. When touched, naked fractals can optionally trigger and audio alert. 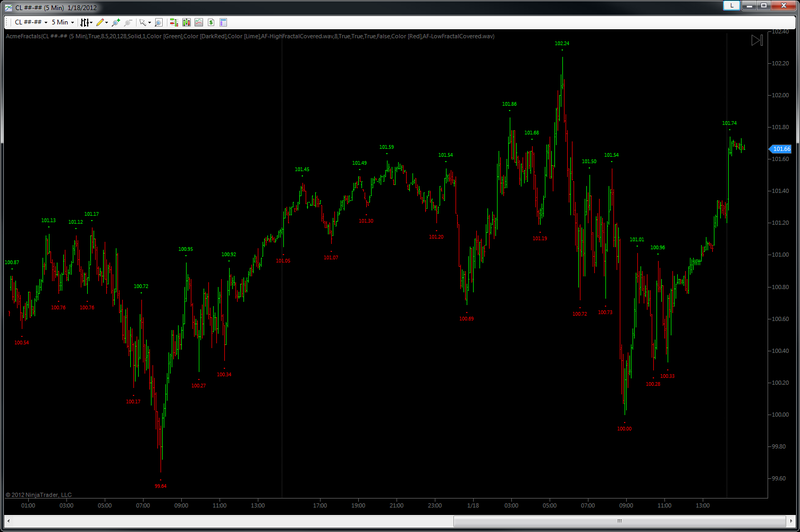 Peak and valley fractals can each have separate line colors, as well as separate alert sounds. “Nakedness” can be turned on and off, as can the extended price labels. 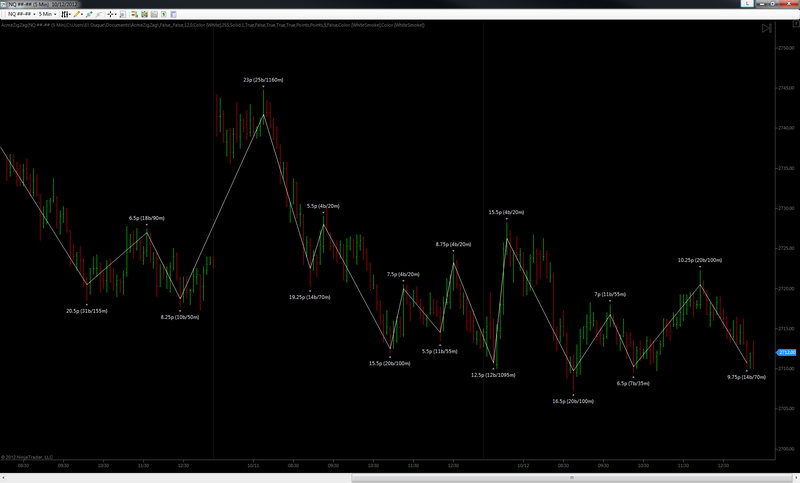 Works on any NinjaTrader bar type. Every trader has heard that you have to learn to “read the tape.” When starting out, no one tell you what that means, so many traders are not totally sure. But one of the ways you can develop an intuitive sense for a market is to watch transactions as they whiz by. How does it behave at important prices? When it’s in between important prices? And in certain instruments, it can be important to know when big volume or a fast blast of small volume is coming in. 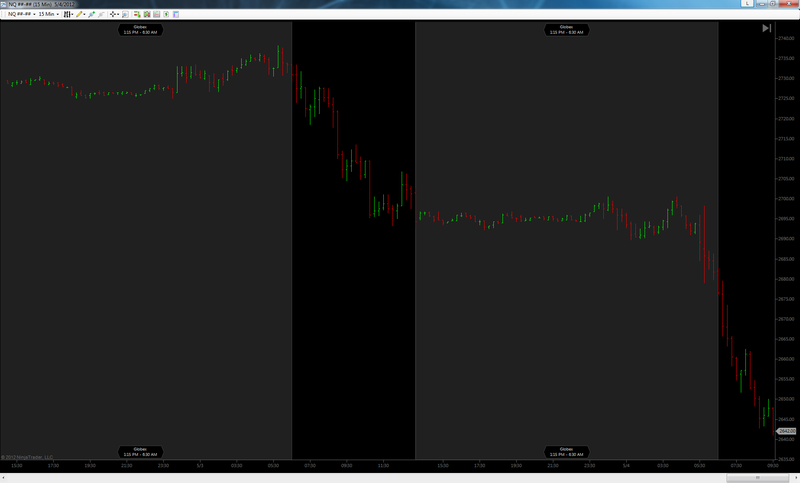 Let’s be honest, most traders are pretty terrible at reading the DOM (the depth-of-market window). Of course many, if not most, short term traders use it for entry and exit. 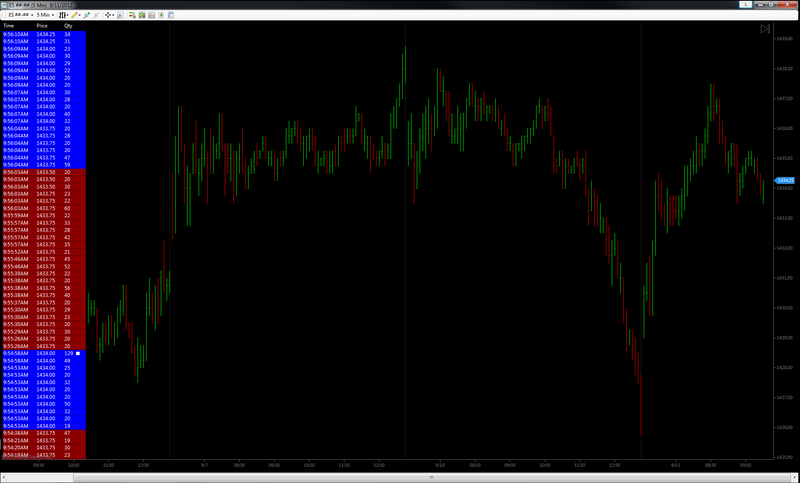 But many traders have never really liked trying to feel buying and selling pressure by watching the DOM. If you blink, you may miss something important! Some traders say they can trade very effectively with nothing but the DOM. No charts. Not sure whether it’s good or bad, but many traders are way too visual. So if this sounds like you too, and you have a 150 or so spare pixels on the left side of one of your charts, then the Acme Magic Tape might be of interest to you. NOTE: this indicator does not work at all with historical data. It’s for watching real-time transactions only. Great for placing in your peripheral vision. The ability to mark block trade sizes. There are regular block sizes and mega block sizes. See above. You can set a special color for mega block sizes so that they catch your eye. 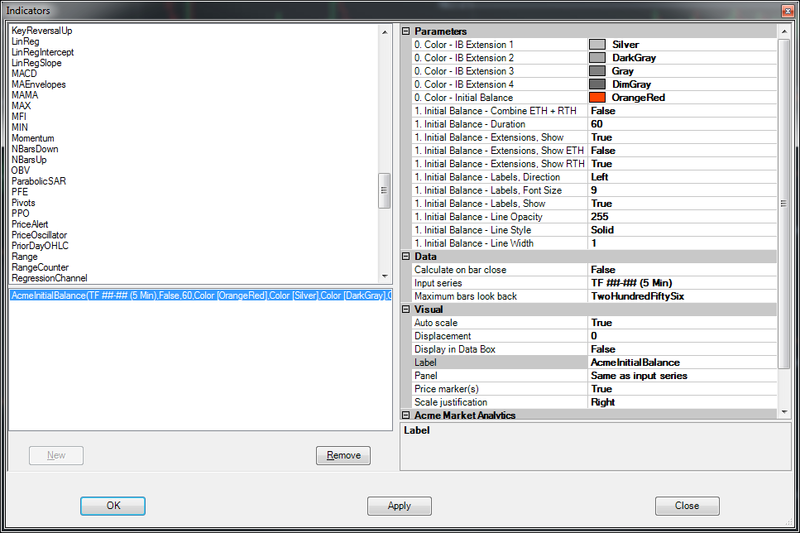 Block trades have optional and configurable audio alerts (Deluxe Edition only). Sound files are provided in the audio alerts pack, but virtually any sound can be used. See the FAQs for audio alert configuration information. Can be set to display 12-hour or 24-hour time. The time column how includes seconds in the display (Deluxe Edition only). 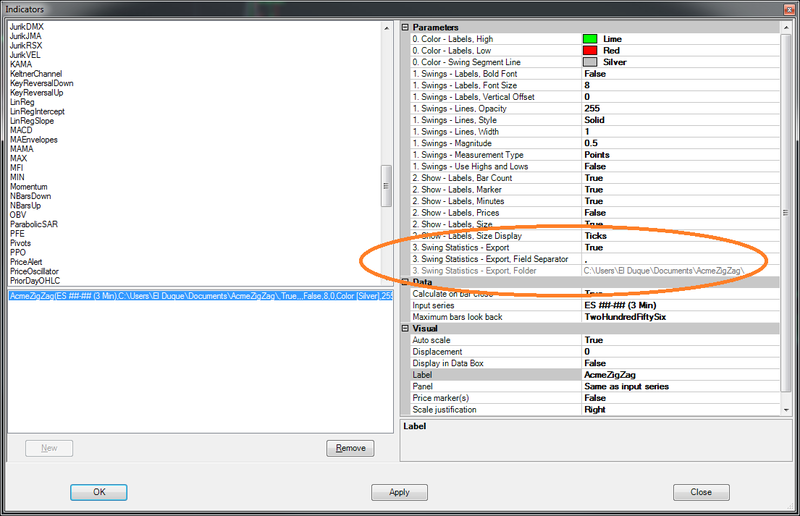 Background colors for buys and sells are configurable separately from the text for fine appearance control (Deluxe Edition only). The ability to filter out transactions below a minimum size of your choosing. The ability to have the minimum size filter turn itself off during ETH. All colors can be customized, including an optional “underlayment” to help increase contrast as it’s drawn on top of the price bars. 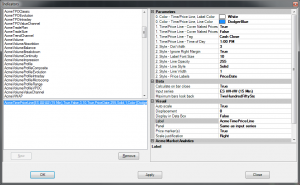 Tape width can be customized, and the maximum number of rows can be set as well. Font size can be customized. This is one of those indicators gets used on lots of charts It has two primary functions. First, it shows at a glance the bars which are ETH and which are RTH. ETH bars can be shaded to any color you like, as below. 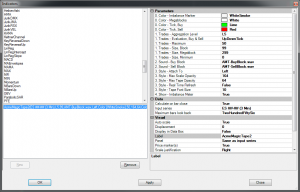 Secondarily, it will count down the values that remain on the most commonly used bar types – minute, tick and volume. For example, on the minute bars it will tell you mow many minutes and seconds remain until the bar is complete. For tick and volume bars, it’ll show you how many ticks or contracts remain until the bar is complete. You can move the “remaining” display (contracts/shares, time, etc) to any of the four corners of your chart. 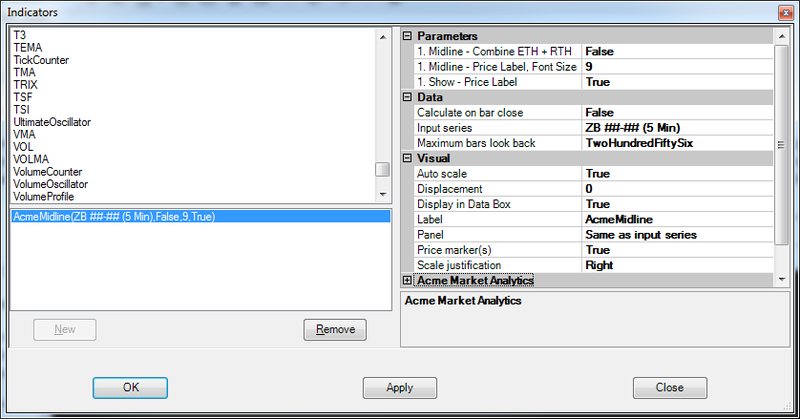 The Acme Bar Timer also has a “watermark mode” which can be handy to place on charts not actively traded but watched, such as currencies, energy, metals and bonds. Again, it helps distinguish everything at a glance. 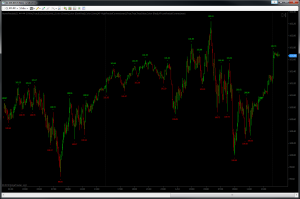 Helpful when you have a peripheral screen filled with smaller charts. You can adjust the color, opacity and size of the watermark to your liking.